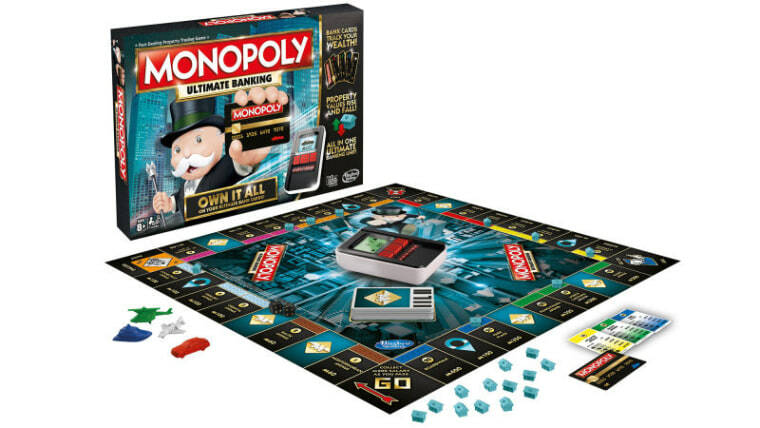 In a move that will delight younger siblings who never got a chance to be the banker -- and infuriate older siblings who had a habit of stashing cash under the board -- Hasbro has released a new edition of Monopoly without any bank notes at all. Just like the real world, the new version comes with a stack of debit cards instead of paper money. In the "Ultimate Banking" edition, which Hasbro revealed at this week’s Toy Fair 2016, players purchase homes and pay rent by scanning the bar code on a property card, then tapping their own banking card on a handheld card reader. "Wasn't one of the beautiful things about Monopoly that, unlike almost anything other kids toys or games, it *didn't* require batteries?" opined one parent on a social media thread discussing the new edition. Others felt it was a welcome change, noting that since "many people get themselves into financial ruin with cards," the new edition might teach the younger set "how to be responsible with the money they can't see." The new version will retail for around $25 and should hit the shelves this fall. Monopoly was first produced in 1935 and has spawned multiple different versions, from an ABBA edition with tokens that include Bjorn’s 1974 star-shaped guitar, to a chocolate version where players can be sent to Chocoholics Anonymous instead of jail.